The Waterpark at The Villages in Texas is quite small by industry standards. It lacks the more thrilling and noteworthy attractions of larger indoor water parks such as a surfing ride, an uphill water coaster, or a bowl ride. It does, however, offer basic water park fun, including a small wave pool, a lazy river, four water slides, and an interactive water play station with a dump bucket. The Aqua Playscape area is especially appropriate for toddlers and younger visitors. The water park has a glass roof and walls to maximize the outdoor light. The retractable roof can be opened during warmer weather. The water park is part of The Villages a condo resort. Owners and guests at the resort receive discounted rates and preferred access to the water park, but the general public is welcome at the park as well. Other features at the park include a party room, a gift shop, and a snack bar. The actual address is 18270 Singing Wood Lane in Flint. From Dallas: I-30E to US-80 E to I-20E. Take exit 556 to US-69/Tyler. Right at Loop 323. Right at TX-155. Right at Big Eddy Rd. Left at FM-2661. Right onto Singing Wood Lane. From Shreveport: I-20W to US-271 toward Tyler. Right at E. Gentry Pkwy/State Spur 147. Left at TX-110. Right at TX-155 to Frankston Highway. Right at Big Eddy Rd. Left at FM-2661. Right onto Singing Wood Lane. This indoor water park's square footage is 25,000 feet. 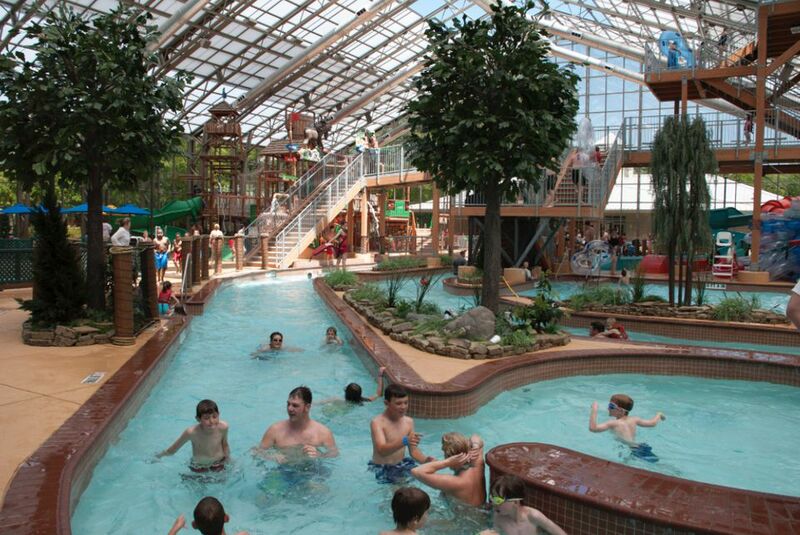 For comparison, some larger indoor water parks can span 200,000 square feet and more. Read more in my feature, "A Lotta Water: Who Has the Biggest Indoor Water Park?" The water park is open to the public, although Silverleaf members have priority when the park is full. Members also receive discounted prices. Reduced prices for children, guests arriving after 4 p.m., and guests not planning to go in the water. Children under 36 inches are free. Multi-day and season passes are available. It is open year-round but closes on some weekdays. See the official site below for hours. What About Parties and Groups? The park offers party packages that include special admission rates, a party room, food, and beverages. Special rates for groups of 12 and more are available. The park does not allow visitors to bring their own food or drinks. It does offer a cafe that features pizza as well as Subway sandwiches. The official website is WaterPark at The Villages. What Is the Texas Star?